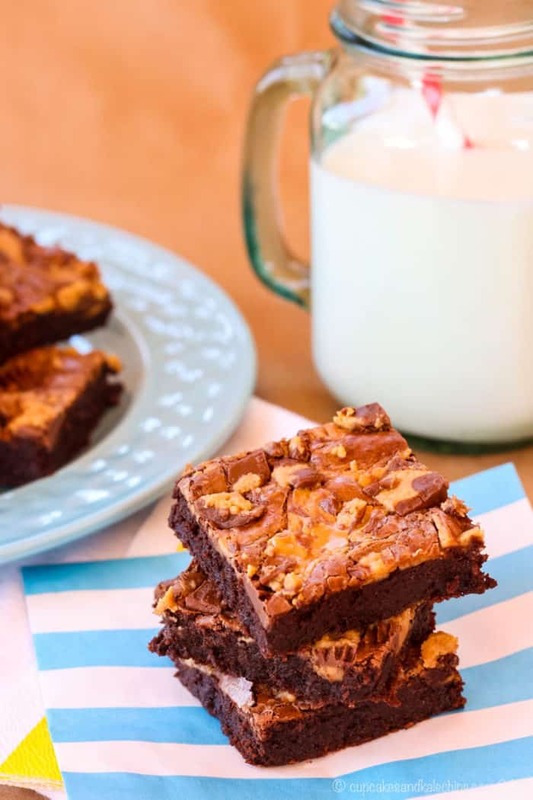 Rich, fudgy brownies swirled with peanut butter and chunks of peanut butter cups make these flourless brownies ridiculously amazing (and gluten free!). Flourless Peanut Butter Cup Brownies taste ridiculously amazing. 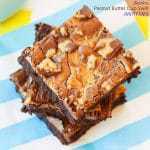 Rich, fudgy brownies are swirled with peanut butter and dotted with chunks of peanut butter cups. You get double the chocolate, double the peanut butter, and none of that pesky flour. So there is nothing to get in the way of all the intense flavor in this easy gluten free brownie recipe that is also one of the best chocolate peanut butter dessert recipes! Originally published on March 25, 2014. Updated and republished on July 19, 2017. A couple weeks ago was one of the Top 10 Days in My Life. Yup, this day ranks right up there with the day I got married, found out I was pregnant, and gave birth to my children. It was the day I confirmed that Baby Smiles is NOT allergic to peanut butter! I hate to make light of this because I know people who suffer from serious allergies and it is a scary thing. But I am seriously addicted to the stuff. Like, open jar and insert spoon-type addicted. Throw chocolate into the mix and forget about it (oh wait, I’m from Jersey, I’m supposed to say “fuhgeddaboudit!”). When I was little, we always went to this ice cream place where they make Blend-Ins – you know, ice cream whizzed up with toppings. My order every single time – chocolate ice cream with peanut butter cups. So it comes as no surprise that I had to make a Peanut Butter Cup No-Churn Ice Cream Cake. I’ll let you guess what were the first types of candy to disappear from my Halloween stash. I mean, the only reason to not devour all the Reese’s is to make Flourless Chocolate Peanut Butter Cake Roll so that I can just eat more chocolate and peanut butter with my chocolate and peanut butter. And green smoothies, do you think I usually make blueberry smoothie or a pineapple smoothie or something like that? Nope. Most often it’s, yup, you guessed it, a Chocolate Peanut Butter Banana Smoothie! Heck, I even have an entire Pinterest board dedicated to my Chocolate & Peanut Butter Obsession! So, you know, brownies. And not just any brownies. Naturally these are chocolate peanut butter brownies! Beyond that, they are flourless brownies made with cocoa powder and chocolate chips, just to make sure it has that gooey, chocolate intensity. 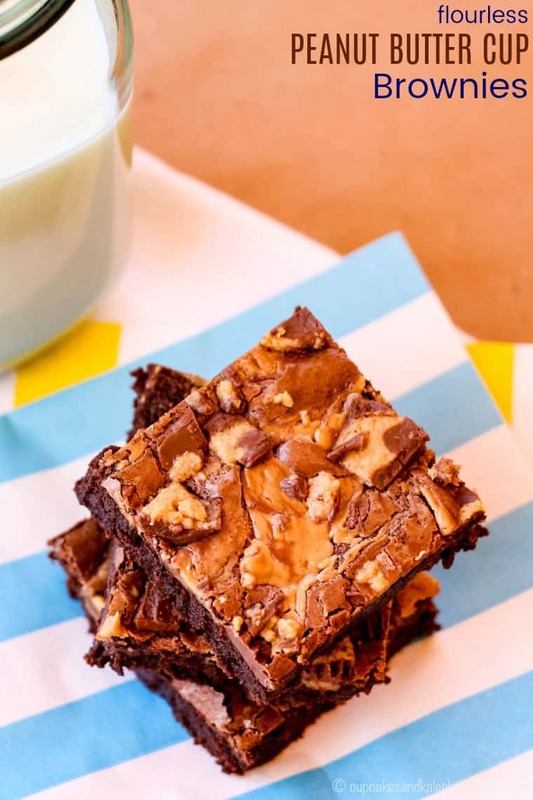 Then they are swirled with creamy, dreamy peanut butter for that salty, peanutty contrast to the sweet, fudgy brownie, and scattered with chunks of peanut butter cups for texture, and, you know, more chocolate and peanut butter. Just pour me a glass of milk and give me one (dozen)! Or if you actually manage to not eat the entire pan, you could always make these Brownie Peanut Butter Mousse Parfaits. How do you make Flourless Peanut Butter Cup Brownies? First, line your brownie pan with parchment paper. It really helps with removing these uber-gooey brownies from the pan. Now whisk the eggs and sugar until they get thick and pale yellow. Don’t rush this step, but it really only takes a minute or two. 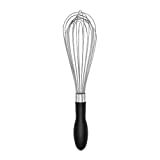 And yes, I do typically do this by hand with a wire whisk. I figure it helps burn off some of the brownie calories. Add the chocolate mixture a little at a time into the egg mixture, whisking constantly until it is smooth. The final step of making the batter is to whisk in the almond meal, vanilla, cocoa powder, and salt. Next, pour it into the pan. Finally, drizzle the batter with peanut butter and swirl it around, sprinkle on the peanut butter cups, and bake. Are Flourless Peanut Butter Cup Brownies gluten free? As I mentioned, this is a flourless brownie recipe, so it is naturally gluten free. 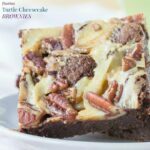 It is my go-to brownie recipe, and I’ve turned it into everything from Flourless Nutella Cheesecake Swirl Brownies to Flourless Caramel Cashew Cheesecake Brownies. 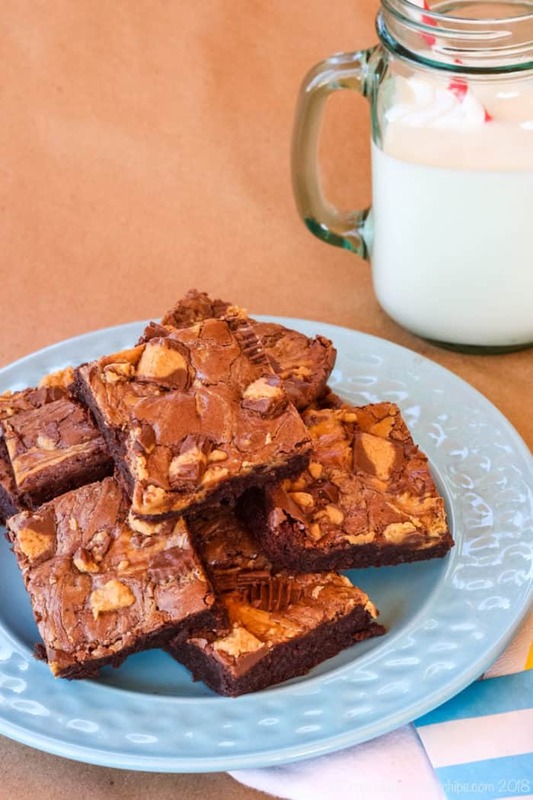 While these brownies don’t contain all purpose flour, they do have almond meal or almond flour, which is gluten free and typically easy to find these days. Always be sure to read labels on ingredient such as vanilla extract and cocoa powder to ensure that they do not have any sneaky gluten-containing ingredients or are produced in a facility where there could be cross contamination. You might also want to check your chocolate chips. I always use the Costco-sized bag of Nestle Toll House Morsels. So there’s just one last thing to check when making Flourless Peanut Butter Cup Brownies. Are Peanut Butter Cups gluten free? Hershey states on their website that all Reese’s Peanut Butter Cups are gluten free except the specially shaped ones for the holidays. So just stick with the regular or mini Reese’s and you are good to go. 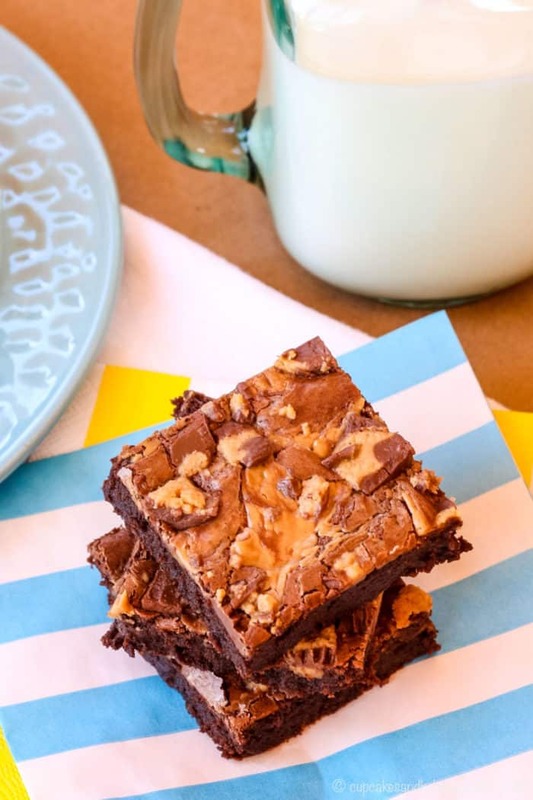 You can also use Justin’s Peanut Butter Cups or make your own Honey Sea Salt Peanut Butter Cups if you want to make these Flourless Peanut Butter Cup Brownies totally from scratch. You could even swirl it with the Honey Sea Salt Peanut Butter you stuff in the cups. 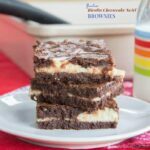 What are some more gluten free flourless brownies recipes? These Flourless Mocha Brownies from That Skinny Chick Can Bake have a secret ingredient, and I’m not talking about the coffee. 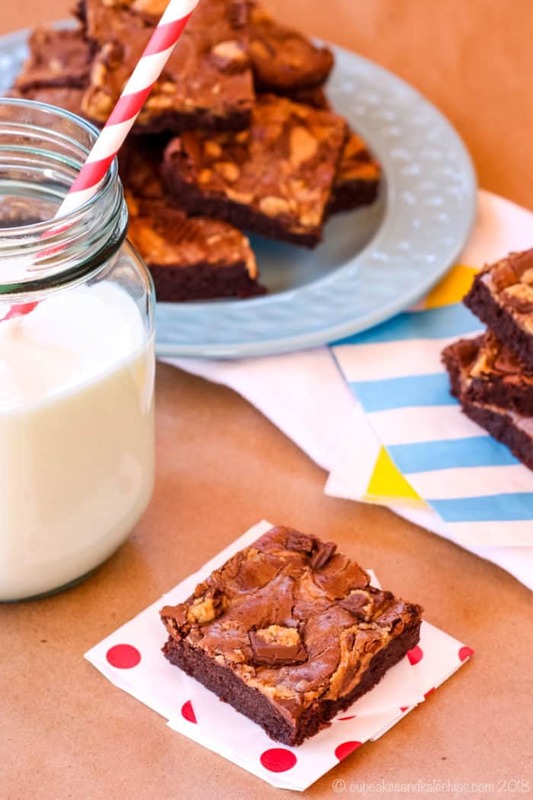 Fudgy Toffee Flourless Brownies from Mom on Timeout are so gooey. And if you want to change things up a bit, try Flourless M&M Brownie Cookies from Foodie with Family. Making gluten free brownies doesn’t get any easier than when you just skip the flour completely and bake flourless brownies. This makes them extra rich and fudgy. Then add swirls of peanut butter and plenty of Reese’s Peanut Butter Cups and you have a pan of epic chocolate peanut butter brownies that nobody can resist. 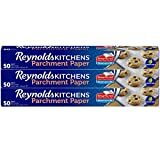 Preheat your oven to 350°F and line a 13×9 inch pan with parchment paper (or grease really, really well, though I’d recommend the parchment). In a double boiler or a bowl set over a simmering pan of water, melt the butter, then add the chocolate chips, stirring until melted. Set aside to cool slightly. In a large bowl, whisk together the eggs and sugar for a minute or two. Add melted chocolate mixture a little at a time, whisking well after each addition. Whisk in the cocoa powder, almond meal, salt, and vanilla. 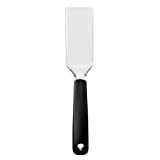 Place small dollops of the peanut butter over the batter and then create swirls with a butter knife or small spatula. Scatter the chopped peanut butter cups over the top of the batter and lightly press in any larger chunks. Bake at 350°F for 20-25 minutes, or until just set in the middle. Adapted from these Flourless Nutella Cheesecake Swirl Brownies. 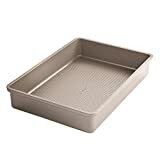 I love how you size your brownie recipes for 9″x13″ pans, while every other website I’ve looked at uses an 8″ square! LOL!!! A baker after my own heart… These look amazing. I’m going to make them for my son’s talent show tomorrow night. Yeah, chocolate and peanut butter desserts always get my attention! These brownies look fantastic! I seem to be the only one that has never used almond meal. Where do I find it? I’d love to try these brownies. Thanks! I can find it at my regular grocery store, but worst case you can try Whole Foods or order form Amazon. This look like I want to rip my screen to eat them. I was recently diagnosed for gluten intolerance and am allergic to eggs. I tried Betty Crocker brownie mix with egg replacer and it stuck to my pan and so greasy that I just threw the whole thing in trash. I would really like to try these but want to know if an egg replacer would work or not. Oh no! Honestly, I’ve never used the Betty Crocker gluten free mix and have never worked with egg replacer. I’ll see if any of my vegan friends have used egg replacer in a recipe like this. I know that sometimes egg is critical in gluten free baking to hold it together since it doesn’t have the gluten from flour. I love when people take recipes and make them their own! Have fun experimenting! Peanut butter makes everything better. Even flourless chocolate cake/brownies! Favorite chocolate-peanut butter treat? What ISN’T? That’s my answer! Those bars look so good. I haven’t salivated this much for a very long time. Damn….I really want that third prize pack….. These brownies sound fabulous! I will make them for my niece’s birthday party. The family always says I don’t need to bring anything when I ask but I know they love it when I bring any of my chocolate goodies. I’m pretty much known for being a chocoholic – not sure that’s a good thing!?! My favorite is my chocolate peanut butter pie. It’s so light and fluffy and has lots of chopped up peanut butter cups all through it and scattered on top for garnish. Mmmm! My favorite, go-to chocolate & peanut butter treat is the good ole Reese’s peanut butter cup. But this? This looks AWESOME! I make peanut butter & banana sandwiches and add a dab of nutella. It is so delicious and I nice little treat! Pinned this – thanks for sharing! I love tastykake Tandy kakes, and now I can get them in kentucky!! Reese’s have always been my favorite chocolate peanut butter item. And I love anything made with them! Peanut butter no bakes are my biggest weakness. my mom’s chocolate peanut butter pie! I had a chocolate peanut butter pie years ago and it was about the best thing ever. I love many forms of chocolate and peanut butter together! I had some giant peanut butter cup chunks last night from my husband’s “Everything But The…” Ben & Jerry’s pint. Those were wonderful. I also love chocolate peanut butter brownies like you made! I really like peanut butter cookies with chocolate chips too. I have yet to meet a chocolate and peanut butter combo that I don’t like, actually! These look spectacular! And the prize pack looks pretty awesome, too. Love, love, love chocolate peanut butter pie! Amazing, I can’t wait to make these! I love just a good classic peanut butter cup. I can’t decide which of these is my favorite. They’re all divine. Another great recipe not listed is: Devils Food Cupcakes stuffed with Peanut Butter Ball and frosted with Peanut Butter Cream Frosting. Oh my goodness, these are so delicious! I love peanut and butter candy, brownies, cakes…. mixed together they are delicious!! I meant peanut butter and chocolate!!!! My favorite has to be smittenkitchen’s chocolate cake w/ PB frosting. Or maybe it’s moose tracks ice cream…or maybe just an english muffin w/ nutella and PB – I can’t even decide! Love chocolate peanut butter cups! Peanut butter brownies are my fave. Your brownies look wonderful and to imagine they are flourless — wow! I know they would be a 5 star recipe, even though I haven’t baked them yet. With no flour, the chocolate would only taste richer!! If forced to choose, I would have to say my favorite chocolate peanut butter confections were Buckeyes and a good creamy peanut butter pie with a chocolate crust and a chocolate topping. Delicious!! i love all kinds of recipes and eating different kinds of chocolate and peanut butter. Chocolate peanut butter cheesecake rocks! I like my peanut butter and chocolate the old fashioned way…….Peanut butter scooped out of the jar with a bar of dark chocolate. Simple and oh so good. My favorite peanut butter and chocolate combo is the dark chocolate dreams peanut butter from peanut butter&company! YUM!!!!!!!!!!!!!! They are sooooooooooooooooooo gooooooooooooooood! I’m a fan of no-bake chocolate-peanut butter oatmeal cookies. They’re quick to make and perfect to use as candy egg “nests” for springtime treats. 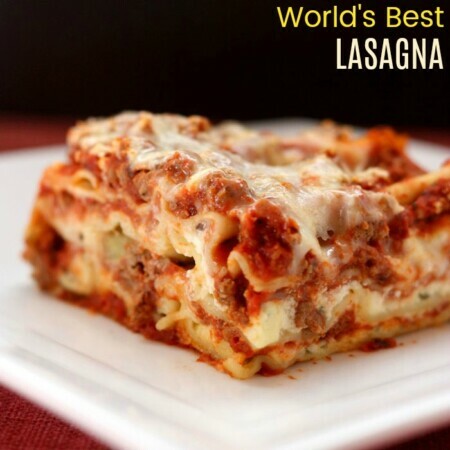 OMG what a marvelous giveaway and what a delicious recipe!! Hope i win!!! Baskin robbins pb chocolate ice cream….or just pb and chocolate chips/bars (whatever is in the house) on a spoon with my morning coffee!! Make them ASAP! Trust me! I would like Pack#3, peanut butter ummmmmmm! My favorite chocolate- peanut butter is Muddy Buddies. Sharing with a GF friend! OMG this looks so yummy! 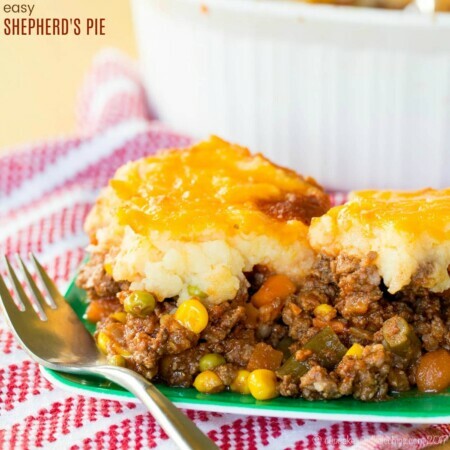 I’ve been reading your blog for a while now, but I just had to comment on the deliciousness in this post! Definitely making these this weekend… I’m usually a fan of anything chocolate and peanut butter, but absolute fav is the peanut butter blossom cookies that my mom has been making as long as I can remember. She brings them to every party and always gets asked for the recipe. Thanks so much! My mom makes the peanut butter blossoms every Christmas! So many “favorites”. But I have been thinking a lot lately of a chocolate cake with peanut butter frosting my incredible step mom makes. Brings back some amazing memories. my favorite is chocolate p-nutburrer brownies! love any thing with those two ingredients! Reece’s peanut butter cups are my ultimate favorite, but anything, just about, with those ingredients would be good! I love fluffernutter brownies! One of my guilty pleasures. Chocolate brownie with peanut butter frosting!!! So good! There sus nothing better than, PB and chocolate cover cookies as a treat, is our family favorite. And thank you for the recipe looks Delish. My brother’s buckeye candy, good thing he only makes it once a year! These looks fantastic!! My favorite peanut butter and chocolate treat has to be the original reeces peanut butter cup 🙂 I wish I had one right now. Chocolate peanut butter cheesecake is a favorite. I like to make peanut butter no bakes with mini chocolate chips in them. My favorite peanut butter and chocolate treat is chocolate covered Ritz crackers with peanut butter smeared generously on top! Peanut Butter and Chocolate. …a match made in heaven! My favorite combination of the two is a brownie recipe that I make called Double Chocolate Chip Peanut Butter Heaven. Keeping my fingers crossed that I win this giveaway! Anything with chocolate and peanut butter is great with me! MY favorite is totally chocolate peanut butter cups! Particularly of the Reese’s variety! I love the peanut butter Twix. Love the contest and the recipes! thank you! Reese’s peanut butter cups are my favorite! Peanut Butter M&Ms are my weakness. I love a big reeses peanut butter cup and a cold glass of milk! When I need a quick fix, I get a spoonful of crunchy peanut butter and dip it in semi sweet chocolate chips…yum! My favorite is chocolate cake with peanut butter frosting. I love peanut butter and chocolate ice cream from Baskin Robbins!!! Peanut butter is one of my favorite things to eat. The brownies look great. Please post this comment. I bumped the rating button and post too fast on my first. Thanks. Anything with PB, right now on my waffles for breakfast! I grew up eating buckeyes… Still love them! what could be better than chocolate and peanut butter? Not a darn thing! Penut butter is one of my favorite things to eat. The brownies look delicious. I love Peanut Butter and Chocolate Chip cookies. Give me a Reese’s Peanut Butter cup any day!! Peanut butter cups made with dark chocolate are my favorite chocolate/pb combo. Thanks! I must say, they are! Yum! I love chocolate peanut butter ice cream! 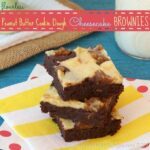 Yes I love me some brownies, especially when peanut butter is thrown into the mix! 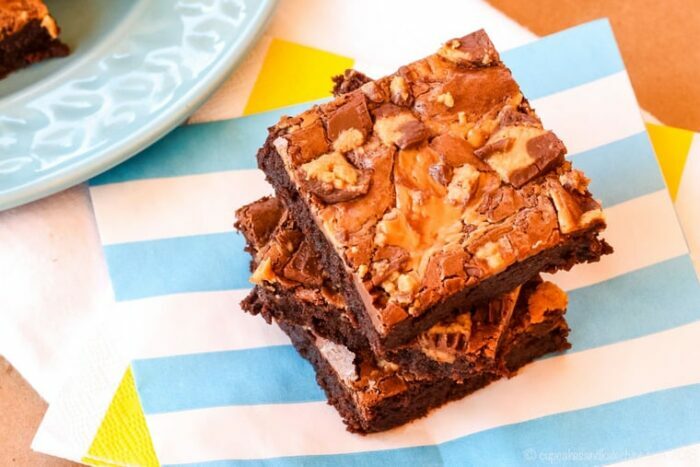 Peanut butter makes everything better, even awesome brownies! These look so great! I love the swirl! Thanks so much! I love making them all swirly and pretty. I remember how excited I was when I discovered my kids were not allergic to peanuts. I’m hugely addicted to peanut butter and–not to make light of the matter–I was just so happy we could continue keeping it in the house! Great recipe for Chocolate Peanut Butter Day! I know! I feel bad because I know people who deal with serious allergies, but it would be such a huge change. The almost-4-year old wouldn’t have take it well either! I’ll take two with a nice tall glass of ice cold milk! My mom makes an awesome peanut butter fudge with with chocolate chips mixed in. Love that these are flourless, Brianne! Great choice! I totally would have eaten it all too! love a good chocolate/pb brownie! These look too good for words! What a great way to celebrate #ChocPBDay! Thanks so much and thanks for all of your hard work! Made these for my daughter to take to the combined youth activity, but not before grabbing a piece for those of us staying home. Super sweet, I’m going to make it again with 2/3-3/4 cup sugar instead, and maybe GF peanut butter chips too. 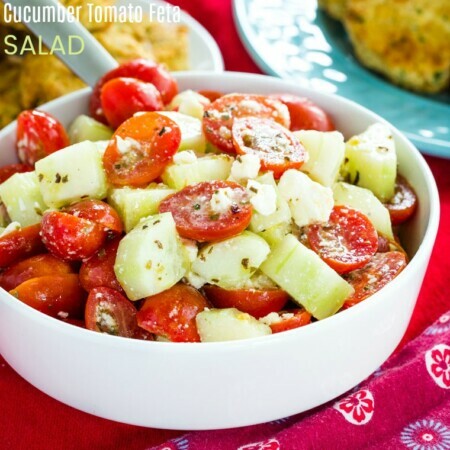 Thank you for posting a gluten free recipe! And dairy free! Glad you liked them, and that you are going to tweak them to your tastes! My favorite chocolate and peanut butter treat are homemade peanut butter cups! I make them all the time, with graham crackers mixed in the peanut butter part to give it a crunch. Dark chocolate and PB ice cream! YUM! I can’t even tell these are gluten free! So delicious looking. flourless is so good and moist! Tweeted and pinned tonight, stumbled, Google + and FB tomorrow! Thanks Kelli! 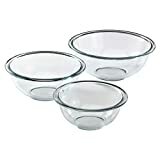 Yes, definitely not missing anything by leaving out the flour in these! I can’t get over myself… I’m SWOONING over these, Brianne! I love chocolate peanut butter balls. oh, these look soooo very good! i gave up lots of my stuff when i had to pack and move quickly. i am at bare basics. this would be wonderful! Flourless, you say! I am so making these for a new friend who is gluten-free. Well, as soon as I check that she’s not allergic to peanuts. 🙂 These are wonderful, Brianne! They look so chewy and rich! Darn allergies! They are nice and chewy and fudgy! Enjoy! Brianne, I’m so glad you went the over the top, indulgent route with your recipe today. Today’s fabulous made up holiday deserves no less, lol. I’m swooning over how fudgy, rich and chewy these look. I’m so glad that Baby Smiles isn’t allergic to peanuts. It seems that there are so many kids with the allergy nowadays which would make life so hard for both you and him. Whew! Now you can keep indulging! Haha, yes, all fake holidays should be celebrated with decadence! After making flourless brownies for a gluten-intolerant friend I became a huge fan. Swirling them with peanut butter is just extra awesome. They are pretty awesome. So much easier to make flourless (or just almond meal) treats than mess with a bunch of different gluten free flours. My favorite chocolate-peanut butter treats are the peanut butter-filled chocolate candy cups I make myself. Oh good, I hope she enjoys them! I GET IT-I am terrified of having children with nut allergies! So happy baby smiles is free and clear! and SO HAPPY YOU MADE THESE BROWNIES! so dense and decadent and perfect! It really is scary! Luckily all is good here, so I can make more of these! Haha, I’m sure they will love them! Peanut Butter Cup Lovers Rice Krispie Treats!!! Reese’s PB cups or Chocolate PB ice cream or BOTH! A spoonful of peanut butter with chocolate chips on top= perfection. I like chocolate peanut butter milkshake. Wow, would have never guessed these didn’t have flour in them. Look great!!!! Yeah, I love this base recipe! It works so well! I love reese’s peanut butter Easter eggs. Rich and fudgy goodness in these brownies for sure. And I totally agree that a little indulgence from time to time is a good thing. My favorite chocolate peanut butter treat is chocolate cake with peanut butter frosting! I love Reeses Peanut Butter cups. My favorite chocolate-peanut butter treat is homemade peanut butter ice cream drizzled with homemade hot chocolate fudge! I love anything with peanut butter and chocolate…..especially peanut butter bars – pb cookie base, creamy pb filling, and chocolate ganache on top!!! Thanks for this opportunity, Brianne! I like homemade peanut butter cups (but Reese’s will do in a pinch!). Buckeyes! Definitely Buckeyes. Peanut butter and chocolate just goes so good together! Sounds awesome! My favorites sweets have peanut butter and Nutella! The Chocolate Peanut Butter Cookie Dough Ball looked really good…. but then again a Chocolate Peanut Butter Cake would be good too! Buckeyes. I would love to make your recipe, but we are VERY tree nut allergic here. So many great sounding recipes, and then I see NUT meal or NUT flour! Sorry! So far the best results I’ve had in gluten free baking are with almond flour. I do want to branch out more. I’m not sure I have a favorite chocolate peanut butter treat…they are all my favorite!!! There’s a local candy shop here that makes their own dark chocolate peanut butter cups. HEAVEN!!!!! I love all things chocolate peanut butter. I’m a sucker for Reese’s Peanut Butter Cups. Thanks for checking it out! Enjoy! I LOVE Haagen Daz chocolate peanut butter over cream. Best combo in the world. PB M&Ms are my go-to candy when I need my peanut butter/chocolate fix! Hooray that Baby Smiles is NOT allergic to peanut butter! It would be so hard if my kids were allergic. . love that you made FLOURLESS brownies!!! Pinned and can’t wait to try! yum! I am so in love with flourless brownies. Just makes them extra chocolaty. And here – peanut buttery! My favorite will always be chocolate + peanut butter ice cream! I can’t wait to try them…excited to be part of a great day with you! It was a fabulous event! Thanks Taylor! These are great & I love that they are flowerless! What a great way to get the taste we all crave! Whoa! TOO MUCH GOODNESS for this time in the morning! My head is spinning! Why do you torment me with so many delicious looking recipes at 7am AND work with Peanut Butter and Co? They are amazing! I am so very jealous! Your brownies literally look like THE PERFECT peanut butter brownie! I cannot even begin to chose my favorite, but probably a white chocolate reeses is my ultimate, or a blondie with peanut butter m and ms! Yum! Now I have to go on my run, dreaming of PB and chocolate! Hahaha, thanks! 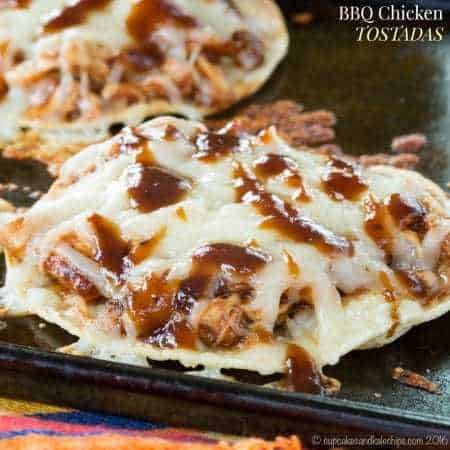 This week is killing me checking out all of these recipes!